The garage services that I.G. MacCullock & Sons can offer you. We have a wealth of experience in the motor industry having been in business for over 50 years. We began trading in a small way in nearby Belstone in the late 1950s and moved to our first main site on East Street in Okehampton in 1964. Today we still remain on East Street where we offer a wide array of services with three generations of the family now involved in the business and committed to providing a quality service to our valued customers. I.G. 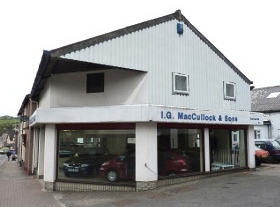 MacCullock & Sons car sales department also supplies used and nearly new low mileage vehicles, as well as new cars to order. All our cars are thoroughly prepared by our workshop and serviced prior to sale so you can rest assured you're getting a quality car you can rely on. All cars come with a warranty and are given a new MOT upon purchase. All content copyright I.G. MacCullock & Sons 2019 unless otherwise stated.